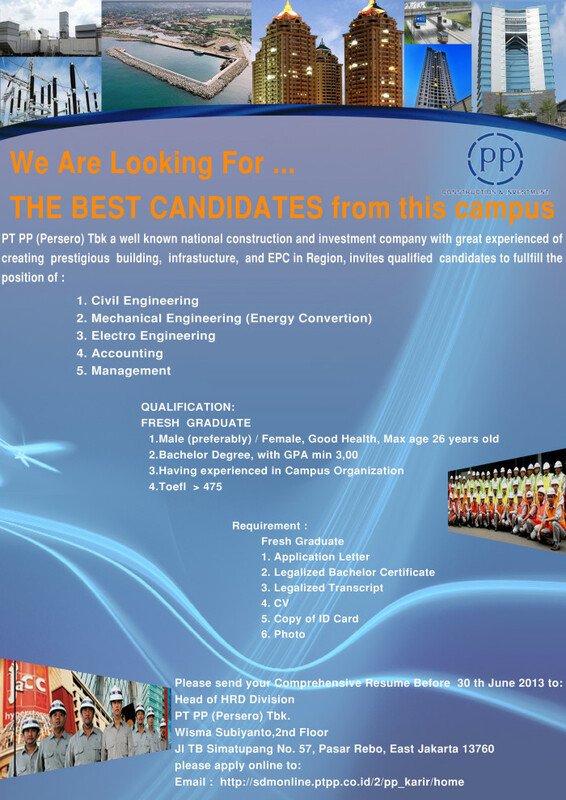 Should you interested, Please send your complete application letter, CV, copy of legalized education diploma, copy of education transcript, relevant University Certification, KTP, color photo (size 3x4) and supporting document to Head of HRD Divisio, PT PP (Persero) Tbk, Wisma Subiyanto 2nd Floor, Jl TB Simatubang No 57 Pasar Rebo East Jakarta 13760 at link below. All applications are appreciated and will be treated confidentially. Only qualified, short-listed applicants will be invited for furthers process. Closing Date : 30 June 2013. Psychological Test schedule and location will be announced later.